A high-quality website and associated social media campaign can put you on the map. At Raising the Bar Media, our website content writers have crafted thousands of customized websites and blogs for a wide range of companies. We offer expert content development and implementation of full social media campaigns. An informative and persuasive website makes the difference between potential clients contacting you or reaching out to a competitor. Whether you need a new website or want to refresh your existing site, talk to Raising the Bar Media. We know how to improve your search results with optimized content that reaches your audience. Smart website design: As potential clients migrate to smartphones and tablets, responsive, cross-platform design is essential to maximize the ability of potential clients to view your products and business. Authoritative content: Digital marketing through a website, blog, video or social media gives you the opportunity to establish credibility and authority with well-researched and expertly written content. Flexibility: Digital communication and marketing provide multiple methods to convey your message through video, image, and the written word. 24/7 marketing: Enhance your credibility and engender trust in new clients or B2B connections through well-written digital and social media content. Set up a storefront in the digital marketplace. Talk to Raising the Bar Media about your website, blog, and digital marketing campaign today. 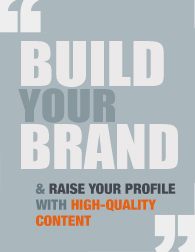 Our website content writers help you build your brand and raise your profile.